This is the first in our series of looking back at the Georgia filming locations for The Dukes of Hazzard. It’s a little known fact that only the first five episodes from season one were filmed in Georgia. In fact, most of the filming took place during the winter of 1978 in and around the towns of Covington, Conyers, and Social Circle. After that, filming moved to the Warner Brothers Burbank Studios in Burbank, California and Walt Disney’s Golden Oak Ranch in Newhall, California. Bo and Luke Duke discover illegal slot machines in Sheriff Coltrane’s police cruiser and use them to raise funds for the local orphanage, which Boss Hogg wants to tear down and build a shopping center in its place. This is the first time we see the General Lee make one of its many jumps. This scene takes place over the railroad tracks near the Covington, Georgia town square. Today, the railroad tracks have been taken up and replaced with a rail trail. The buildings in the background are also gone, replaced with a parking deck and greenspace. This scene is also used in the opening credits, beginning with the second episode of season one. After a long day, the Duke boys are headed to their favorite watering hole in Hazzard County. Today, the old hay barn they pass on the way looks abandoned and forgotten. The General Lee turns off Flat Rock Road into the Boars Nest. The Boars Nest is the local hangout for many of Hazzard County’s working class folks. Daisy Duke, is a waitress there and the boys stop by to grab a brew and catch up with the locals. The building is still there today, but it’s now the Deliverance Christian Tabernacle. The Duke boys, Cooter, and a couple friends get together at Cooter’s junkyard and come up with a plan to hijack the illegal slot machines. The junkyard is long gone and Mother Nature has started to reclaim the property. Another view of Cooter’s junkyard. This old vehicle waits for the day that it will hopefully be restored to its former glory. Another view of Cooter’s junkyard. Once the Duke boys, Cooter, and their gang figure out where the truck transporting the slot machines is headed, they get Daisy in a skimpy bikini to flag down the truck at the Hazzard County line. She pretends her car is broken down in order to get the driver to stop. Bo drops by the Sheridan Orphans Home to drop off the first bag of loot from the slot machines. Since Boss Hogg has threatened to shut down the home in order to build a shopping center, the Duke boys use the proceeds from the illegal slot machines to help Jill Dodson keep the home running. The home, known as the Zachary – Echols House, was built in 1854 and is still standing today. Sheriff Coltrane and his deputies are not happy that Bo and Luke broke Daisy out of jail. The old sheriff’s office was closed in 2003. A Georgia Federal Credit Union now occupies this location. While outrunning the deputies, the Duke boys use a dirt pile as a ramp to jump over Sheriff Coltrane’s police cruiser and make their getaway. The jump was performed on the campus of Oxford University on a Saturday in order to evade a crowd of students. The jump measured a distance of 81 feet and launched the General Lee 16 feet into the air. 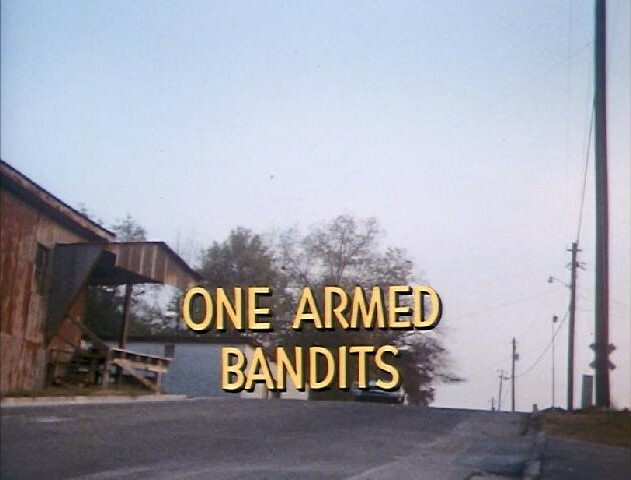 This jump is also seen in opening credits, beginning with episode two of season one. The Duke boys are flying high as they soar across the sky in front of Seney Hall at Oxford College. The road in front of the hall was closed in 2013 and converted into a brick walkway. Other than that, Seney Hall looks much the same as it did back in late 1978. The General Lee finally lands near Seney Hall after jumping over Rosco’s patrol car. Hopkins Hall is in the background. Sheriff Coltrane is in hot pursuit of the Duke boys as they make their way to the orphanage. Rosco chases the Duke boys through the Covington town square. The Dukes are on their way to the orphanage to take Jill Rae Dodson the proceeds from the slot machines. These two old men on the courthouse steps get a kick out of watching Bo and Luke outrun the sheriff through the Covington town square. With Sheriff Coltrane in hot pursuit, the General Lee crisscrosses through the railroad crossing drawbars on its way to the orphanage. Almost there! The General Lee makes a sharp right turn on Herring Street and makes a beeline for the orphanage. Here’s one reason why we couldn’t get better photos inside Cooter’s Junkyard. We didn’t want to trespass on the property and risk getting into trouble.